Cetuximab (anti-EGFR), a novel molecular-targeted agent,is an inhibitor of EGFR monoclonal humanized antibody interacting with the extracellular binding site of EGFR to block ligand stimulation. MW : 145.781 KD. c, HCC4006 lung cancer cells that have acquired a high-mesenchymal state concomitant with becoming resistant to gefitinib (red curve) exhibit increased sensitivity to GPX4 inhibition. Theliatinib (HMPL-309) is a highly potent EGFR inhibitor with Ki value of 0.05 nM against the wild type EGFR and IC50 values of 3 nM and 22 nM against EGFR and EGFR T790M/L858R mutant. It demonstrats 50 fold greater selectivity for EGFR compared to 72 other kinases. Cyasterone is the main phytoecdysteroid component found in Cyathula capitata. It is a natural EGFR inhibitor and maybe a promising anti-cancer agent. Osimertinib mesylate is the mesylate form of osimertinib, which is an oral, third-generation epidermal growth factor receptor (EGFR) tyrosine kinase inhibitor (TKI) drug. Avitinib (AC0010) is a pyrrolopyrimidine-based irreversible EGFR inhibitor that is mutation-selective with IC50 value of 0.18 nM against EGFR L858R/T790M double mutations, nearly 43-fold greater potency over wild-type EGFR (IC50 value, 7.68 nM). It has comparable anti-tumor activity and tolerated toxicity. Gefitinib is an EGFR inhibitor with IC50s of 15.5 nM and 823.3 nM for WT EGFR and EGFR (858R/T790M), respectively. Increased expression of VEGF and p-STAT3 induced by CXCL1 was blocked by either AG490 or SB225022 in AGS cells. Dacomitinib (PF299804, PF299) is a potent, irreversible pan-ErbB inhibitor, mostly to EGFR with IC50 of 6 nM in a cell-free assay, effective against NSCLCs with EGFR or ERBB2 mutations (resistant to gefitinib) as well as those harboring the EGFR T790M mutation. Phase 2. WZ4002 is a novel, mutant-selective EGFR inhibitor for EGFR(L858R)/(T790M) with IC50 of 2 nM/8 nM in BaF3 cell line; does not inhibit ERBB2 phosphorylation (T798I). Antitum o r activity of WZ4002 and/or E7050 in mouse xenograft models of human tumors. SCID mice-bearing PC-9/Vec (A), PC-9/HGF#5 (B), H1975 (C), or HCC827ER (D) tumors were administered 25 mg/kg WZ4002 and/or E7050 once daily for 14 to 21 days. Tumor volume was measured using calipers on the indicated days. Mean?SE tumor volumes are shown for groups of 4 to 5 mice. A549 cells were treated with G15 (a specific antagonist of GPR30, 1 uM), AG1478 (a potent antagonist of EGFR, 10 uM), BPA (10-5 M) alone for 15 min or BPA after a 90-min pretreatment with G15 or AG1478 for 15 min. Then the expression of p-ERK1/2 and total ERK1/2 were measured by western blot analysis. PD153035 HCl is a potent and specific inhibitor of EGFR with Ki and IC50 of 5.2 pM and 29 pM in cell-free assays; little effect noted against PGDFR, FGFR, CSF-1, InsR and Src. B. Increased of cell migration induced by EGF is inhibited by a selective ATP competitive inhibitor of EGFR (PD153035). Histograms showing HCT-116 cell migration with or without treatment by EGF +/− PD153035. Results are expressed as mean ± SEM. ***p<0.001, sample significantly different from control (N=3, n=7, Kruskal-Wallis test). Pelitinib (EKB-569) is a potent irreversible EGFR inhibitor with IC50 of 38.5 nM. Phase2. IGF-1 and IL-1β mediated induction of Bcl-2 expression involves EGFR. (A) Bcl-2 mRNA levels in AALEBs treated with IGF-1 or IL-1β in the presence or absence of two EGFR tyrosine kinase inhibitors, EKB-569 (1 μM) or PD153035 (1 μM). OSI-420 is the active metabolite of Erlotinib (EGFR inhibitor with IC50 of 2 nM). Mean plasma concentration vs. time after single-dose oral administration of CCB and ERT in six Wistar rats. WZ3146 is a mutant-selective irreversible inhibitor of EGFR(L858R) and EGFR(E746_A750) with IC50 of 2 nM and 2 nM; does not inhibit ERBB2 phosphorylation (T798I). T47D cells were pretreated with 100ng/ml EGF for 20 min and then treated with the indicated concentrations of WZ3146 for 24 hours. WZ8040 is a novel mutant-selective irreversible EGFRT790M inhibitor, does not inhibit ERBB2 phosphorylation (T798I). After starved in serum-free medium for 24h,A549 cells incubated with the indicated concentrations of WZ8040 for 3h,followed by 20-minute stimolation of 100ng/ml EGF. AST-1306 is a novel irreversible inhibitor of EGFR and ErbB2 with IC50 of 0.5 nM and 3 nM, also effective in mutation EGFR T790M/L858R, more potent to ErbB2-overexpressing cells, 3000-fold selective for ErbB family than other kinases. Reversal effect of AST-1306 on the sensitivity of NCI-H460/MX20 cells to mitoxantrone. The figure showes the survival curves of cells at different concentrations of mitoxantrone with or without AST-1306. Cell viability was determined by MTT Assay. NCI-H460 is lung cancer cell line while NCI-H460/MX20 is ABCG2 overexpressing drug (mitoxantrone) selected cell line. Immunohistochemical studies reveal the tumor cells to be negative for chromogranin and synaptophysin pre-rociletinib and positive for both neuroendocrine markers in the post-rociletinib liver biopsy. The results, in conjunction with the morphology, are consistent with the diagnosis of small cell carcinoma in the rociletinib-resistant specimen. H&E, hematoxylin and eosin. Genistein, a phytoestrogen found in soy products, is a highly specific inhibitor of protein tyrosine kinase (PTK) which blocks the mitogenic effect mediated by EGF on NIH-3T3 cells with IC50 of 12μM or by insulin with IC50 of 19 μM. Varlitinib is a selective and potent ErbB1(EGFR) and ErbB2(HER2) inhibitor with IC50 of 7 nM and 2 nM, respectively. Phase 2. B. Effect of Icotinib treatment on the subcellular localization of ABCG2 in NCI-H460/MX20 cell. ABCG2 staining is shown in green. DAPI (blue) counterstains the nuclei. C. Effect of Icotinib on the ATPase activity of ABCG2: The BeFx-sensitive specific ATPase activity of ABCG2 was determined in the presence of 0-5 μM of Icotinib as described in supplemental methods. The activity in the absence of Icotinib (basal activity) was considered to be 100%, and % -fold stimulation ± S.D. (Y-axis) was plotted as a function of indicated concentrations of Icotinib (X-axis). D. Effect of Icotinib on the photolabeling of ABCG2 with [125I]-IAAP: Crude membranes from ABCG2 expressing MCF7-FLV1000 cells were photo-crosslinked with [125I]-IAAP in the presence and absence of 0-50 μM of Icotinib as described in supplemental methods. [125I]-IAAP incorporated in ABCG2 band was quantified using ImageQuant software and plotted as % [125I]-IAAP incorporated ± S.D. (Y-axis) as a function of varying concentration of Icotinib (X-axis). The upper panel shows a representative autoradiogram from three independent experiments and the arrow represents the ABCG2 band photo-crosslinked with [125I]-IAAP. PD168393 is an irreversible EGFR inhibitor with IC50 of 0.70 nM, irreversibly alkylate Cys-773; inactive against insulin, PDGFR, FGFR and PKC. (B) Immunohistochemical staining for α-actinin and EdU showed that EGFR inhibitor (PD-168393), JNK inhibitor (sp-600125), and SP-1 inhibitor (mithramycin A) could abolish the effect of TIMP-3 siRNA in promoting cardiomyocyte proliferation. n=3 per group for Western blot. At least 2000 cells were quantified in each group. Data are shown as mean±SEM and reflect at least three independent experiments. Scale bar: 100 μm. *, P<0.05, ***, P<0.001 versus respective control. CNX-2006 is a novel irreversible mutant-selective EGFR inhibitor with IC50 of < 20 nM, with very weak inhibition at wild-type EGFR. d) Western blots for phosphorylation of epidermal growth factor receptor (EGFR) and MET, cleaved PARP as an apoptotic marker, and b-actin in HCC827 and their resistant clones. Total cell lysates were extracted 24 h after exposure of DMSO, 0.5 μM erlotinib, 0.5 μM CNX-2006, PHA-665752 and their combinations. AG-18 inhibits EGFR with IC50 of 35 μM. (C,D) The Ba/F3 cells expressing EGFR-T854A/C797S/del19 (C) and EGFR-T854A/C797S/L858R (D) were treated with gefitinib, afatinib, osimertinib, and brigatinib for 6 hours at indicated concentrations. EGFR phosphorylation and downstream signal pathway were evaluated by Western blotting. 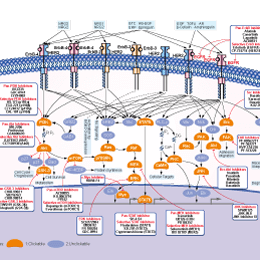 CL-387785 (EKI-785) is an irreversible, and selective EGFR inhibitor with IC50 of 370 pM. C, EGFR L718Q and L844V Ba/F3 cells retain sensitivity to irreversible quinazoline EGFR inhibitors. Cells were treated with different drugs at the indicated concentrations, and viable cells were measured after 72 hours of treatment and plotted relative to untreated controls. For Western blot analysis, 3T3 cells expressing the respective constructs were treated with different drugs at indicated concentrations for 16 hours. Cell extracts were immunoblotted to detect the indicated proteins. D, EGFR Del 1/L718Q Ba/F3 cells have a growth disadvantage. Equal number of cells was seeded in the presence of or absence of EGF or IL3. Cell number was evaluated in triplicate at the indicated time points. AZD3759 is a potent, oral active, CNS-penetrant EGFR inhibitor with IC50 of 0.3 nM, 0.2 nM, and 0.2 nM for EGFR (WT), EGFR (L858R), and EGFR (exon 19Del), respectively. Phase 1. Naquotinib(ASP8273) is an orally available, irreversible, mutant-selective, epidermal growth factor receptor (EGFR) inhibitor, with potential antineoplastic activity. Nazartinib (EGF816, NVS-816) is a covalent, irreversible, mutant-selective EGFR inhibitor that has nanomolar inhibitory potency against activating mt (L858R, ex19del) and T790M mt, with up to 60-fold selectivity over wild type (wt) EGFR in vitro. Butein, a plant polyphenol isolated from Rhus verniciflua, is able to inhibit the activation of protein tyrosine kinase, NF-κB and STAT3, also inhibits EGFR. NSC228155 is an activator of EGFR. It binds to the sEGFR dimerization domain II and modulates EGFR tyrosine phosphorylation.